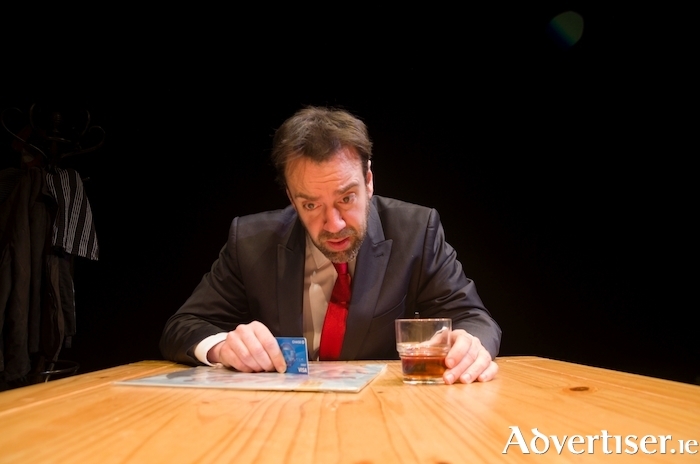 Liam O'Brien in Bottom Dog Theatre Company's production of Drinking In America. EMMERDALE AND Fair City actor Liam O'Brien will play 12 separate roles in one play when Limerick's Bottom Dog Theatre Company stages Eric Bogosian's 1986 play Drinking In America. O'Brien play everything from a grasping show-biz hustler to a wise-cracking ghetto junkie, when the play is performed at the Town Hall Theatre on Friday February 2 at 8pm. He will be accompanied on stage by Choice prize nominated musician Steve Ryan, leader of the band Windings. The play is directed by Patrick J Byrnes. The New York Times called the play “a breakneck, hair-raising comic tour of the contemporary American male psyche" when it was first performed in the 1980s, and this theme of maleness and America attracted BDTC to it. "The rise of Donald Trump was one of the main reasons for choosing to perform it," a spokesperson for the company said. "The play was still powerful we thought some elements were perhaps too dated. Then we started hearing the words Trump was using and seeing the kind of vitriol he was generating. We were witnessing all the sorts of negative addictions – literal and metaphorical – that we thought America had left behind, rising back to the surface. So there sat a play which maybe hadn’t felt that relevant over the years, feeling more immediate than ever." Liam O'Brien has worked with Edward Hall’s Propeller Shakespeare company, appeared in the West End production of The Rat Pack, and starred in Emmerdale as curate Ethan Blake.